There’s something so wonderful about heading to college: suddenly, you’re in charge of almost everything in your life. You have the freedom to go where you want when you want, and you’re able to get involved in a whole host of new and different activities, social groups, and classes. On the flip side, however, you’re also fully responsible for everyday things that you may not have been responsible for before you went away to school. Things, like shopping for your own groceries, doing your laundry, or cleaning your dorm room, might not feel intuitive to you, and suddenly you start to realize that you’re truly the only one who’s in charge. This barrage of learned skills and newly found freedom can be a huge transition and can feel a bit overwhelming at first. After some time, however, you’ll more than likely get into the swing of things, and by the time Thanksgiving rolls around, you’ll probably start feeling like an old pro. And then comes transitioning home for the holidays. The ebb and flow of living on your own and then moving home for the holidays can feel both wonderful and a bit jarring. We’ve put together a list of things for you to consider as you pack your bags and move back into your old bedroom. While you might have a mother who loves to fold your laundry for you and mail you care packages while you’re away at school, that doesn’t mean you should expect your parents to wait on you hand and foot when you return home from college. Now that you’re a college student, you’ve taken a big step toward maturity, so it’s a good idea to show your parents some respect and help out around the house while you’re there. Practically, this could look like clearing your plate away from the table after a meal, helping cook or fold laundry, or even volunteering to take the trash or the dog outside. Don’t forget to try your best and keep your room at least mildly clean. Yes, it’s certainly okay to let your parents make a home-cooked meal for you now that you’re home for the holidays; but while you’re soaking up your mom and dad’s love, it’s a good idea to show them a little love and maturity as well! As a college student, you’ve probably gotten pretty used to coming and going as you please. Sure, you might let your roommates know once in a while if you’re going to be gone a long time or back super late, but the chances are good that you might not always communicate with them about your whereabouts or plans on a regular basis. When you head home for the holidays, there might be some confusion as to how much time you’re spending with family vs. friends, and if your parents should leave the door unlocked for you before they go to bed. It’s a good idea to simply talk about expectations and timing on the front end of your stay so as to avoid any hurt feelings or misunderstandings. Your parents have more than likely poured a lot into your life—they raised you, after all! While it’s normal and good to have some expectations that your parents will ask about your time at college, it’s a loving thing to ask them about their lives as well while you’ve been away. Just because you went away to college doesn’t mean that their lives have stopped, and they’ll feel loved knowing you’ve thought about them and care. Respecting your parents is important too. While you might throw all your clothes all over the floor in your dorm room or take extremely long showers at midnight, try to respect your parents and their resources and keep things tidy in moderation. Going home for the holidays can be a wonderful thing—catching up with family, eating homecooked meals, and sleeping in your old bed are all things that can be life giving and garner rest. 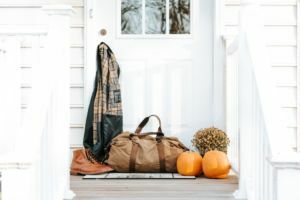 Hopefully these tips will help make the transition a bit easier and give you some sort of foundation to build off of as you plan to head home over Thanksgiving.